“Meet and Eat” is series about congregations and adventures with food writers, food bloggers and others orbiting the food world. I want to be proved wrong when it comes to Texas. The relocation to Jessie’s native state, influenced by the birth of our son, being laid off and desiring a larger family support network, has had a few hiccups. I’ve been wrong before (i.e., tacos). Now I’m wrong about chile con queso, which I lambasted on Slashfood. I’m certainly not apologetic about my story. How can I regret it? The post led me to break bread with fantastic Austin food writers/bloggers who gently pointed out the obvious: I was wrong. 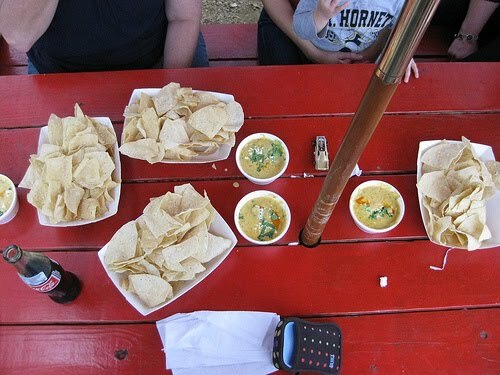 Torchy’s chile con queso was substantial. It didn’t flop off the chip in an ectoplasmic splat. It contained chunks of avocado and chiles and a cilantro garnish. I hadn’t expected the zing zang zoom on my tongue, the lilliputian flavor circus on my palate. This was not the dreck I’ve uneasily swallowed across the state. This was food. This was…. Más, por favor! What struck me more than the surprising queso were the surprising people. Here were folks open to others’ ideas. Folks who didn’t take personally everything this New Yorker said. Folks unlike most others I’ve met here. Austin gives me hope, makes the move to Texas non-regrettable. Austin and its people have helped me discount what I was once told by a Texan, “Be careful what you say, lest you insult someone. You might not like what happens next.” What a welcome! What a terrible thing to say about your own kind! I come from a place where disparaging your own kind, be it New York or ethnicity, is as beloved as baseball. In other words, temper your pride, kids. But I don’t want this to be a referendum on Texans because, as another Texas food writer once told me, “the food and the people are related.” With surprising food come surprising people. Adelante, queso. Adelante, comida. Adelante, Austin. That was a fun rainy afternoon. Very well written post, too. I'm so happy you've come to appreciate our love of a bowl of cheese. Just the word, queso, makes my heart go pitter pat. Thanks. I felt welcomed that day. Now I just need to live there full-time.